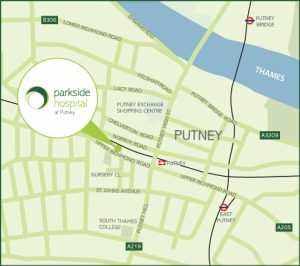 Parkside Hospital offers a range of outpatient services at its Clinic in central Putney and appointments can usually be made with little or no waiting time. Please call 020 8971 8026 for further information or to book an appointment. Mainline railway stations at Putney (with links to Waterloo, Richmond and Twickenham), or Wimbledon plus a short taxi journey. East Putney Tube station (District Line). Routes 93, 337 and 430 stop within walking distance. Car parking is provided for registered disabled patients. Parkside Hospital at Putney was inspected by the Care Quality Commission (CQC) on May 24th 2016 and received the rating of Good. For the full inspection report please clickhere.